Today I received a brand-new package from Gigapan. 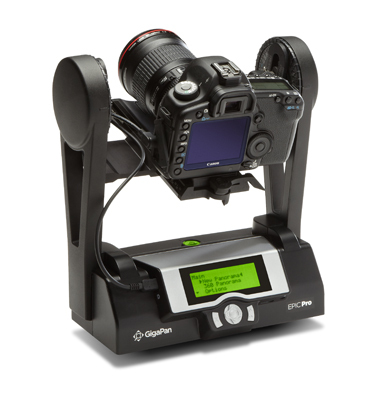 The Gigapan Epic Pro, which has really come of age, even in the packaging! The box arrived in a box and inside it is well packed and already totally assembled save charging the battery. 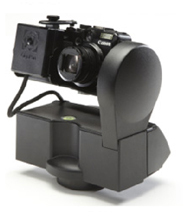 There are three versions of the Gigapan robotic Panorama head to choose from. The Epic: for small digicams. The Epic Pro: A heavy duty version for DSLR's like the Canon 1D and 5DII or the Nikon, Olympus, sony, Pentax flagship cameras. I had the honor of beta testing an earlier version. It appears that a lot of the discovered shortcomings have been handsomely dealt with. The base is solidly attached with no apparent wobble, as far as I can determine. The platform which holds the camera has been refined. The attachment for the camera is to a platform which moves fore and aft with nicely marked measurements so that one can potentially reposition a particular camera reasonable accurately. One surprise that left me flummoxed! 7. Balance the camera and lens on the Epic Pro. and lens are balanced at the center of the axis of rotation. This is the first time I've seen an instruction that concentrates our efforts on balancing mass, rather than putting the entrance pupil of the lens over the center of the axes or rotation of a pano head! This makes me imagine that for the most part, for this machine, it's much more important to have the mass balanced and get a smooth motion of the machine, rather than go for optical accuracy. It is likely that this is of little consequence for stitching of most panoramas, where the elements are at some considerable distance from the camera lens. However, for fence posts within 10 ft or so, there's likely to be considerable mismatch and stitching difficulty. I must admit I'm surpassed by this but It must be a worry where users could attach some massive 600 mm lens to the platform and stress out the motors. I'll address this again later. I'd like to look into balancing the mass and still respecting the constraints of achieving rotation though the centers of rotation of the entrance pupil so that there will be no stitching issues due to poor adjustment to exclude parallax errors. Still, i'd like to stress that it's likely just me fussing and that for most folk's work, obeying the instruction to balancing mass distribution will not likely result in bad panoramas too often, LOL! After all, the guys from Carnegie Mellon University are bright enough to have designed the original forerunner robot for the Mars pano camera, so I think they know where shortcuts can be safely made! To Go Swiss or not? Luckily for my preferences, one of my requests has been answered. So I will imagine I can take at least partial credit, LOL! The base plate of the platform that holds the camera can be swopped out for a custom Arca Swiss style base plate manufactured especially for this by Really Right Stuff. so of course, there was a little parcel that arrived from RRS and I set about to switch out the base plates. Be warned. There's no allen wrench provided. don't make the mistake and go for your set of allan wrenches from your tool boxes. For this you need a metric set. It turns out that a 3mm size is perfect. If you are equipped totally with Arca Swiss dovetail mounts fro your L brackets and everything else, then this is a great idea. 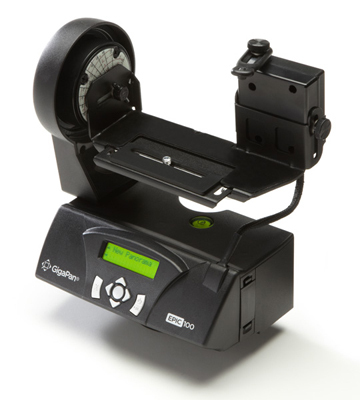 however, if not, just use the updated Gigapan base platform as is and you will likely be happy. So now you can see the modified set up can take advantage of the Arca Swiss standard of dovetail clamps which many of us have on our gear. If one has an L bracket, then one can use the camera in portrait or landscape mode. There are advantages in using portrait mode when one is satisfied with just one or two rows of images. The vertical format allows for using less rows. As you can observe here, the camera appears balanced for mass over the rotation axes, but this does not coincide with the entrance pupil of the camera. How to center both the lens entrance pupil as well as the mass of the camera and lens over the rotation axes of the Gigapan Epic Pro robot? Well my approach would be to get the entrance pupil located over the mass center on a ball head that has been loosened a tad. I'd add a weight with a suitable Arca Swiss groove on to the RRS nodal slide and then lock everything in place and return that setup to the Gigapan pro base to reproduce the same alignment. "At further distances, it is more important that your camera and lens be stable for minimizing parallax error." At closer distances correcting parallax error is far more critical than at longer distances. At longer distances, balancing the camera for and aft on the slide allows one to balance instead for the center of the mass to coincide with the center of a lll the axes as parallax issues are less important. 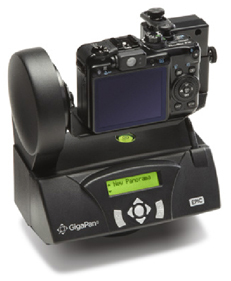 Disclosure: The little Epic I received from Gigapan in the early days for review and afterwards they did not request its return. The Epic 100 Gigapan I tested and then returned. The Gigapan Pro I received at the standard 50% special price offered to all Beta Testers of that unit. The RRS base for the Gigapan I received at 50% discount. Readers will judge whether or not I'm impartial. Looks like one mean piece of kit Asher. Out of interest does the hardware come with its own software for assembling panoramas, or do we still rely upon 3rd party software? This is a solid piece of geared machinery. I hope to test it shortly. Software is free from Gigpan. It works very well as everything is sequential and utterly predictable and regular. Now one can also use other software. For example PTGui or AutoPano Pro. In the latter, there's a built in capability to specify the Gigapan file set and the AutoPano Pro or AutoPano giga software happily processes the file set, taking full advantage of the ordered sets of images. What I want to investigate further is the handling of exposure bracketing in Gigapan software v. Autopano Giga, the Pro software from Kolor. I've yet to do a Pano shoot with more than 3 brackets. I have enough trouble schlepping tripod, pano head, whatever it is, and camera gear and I have not tried shooting tethered to a computer to do Panos in order to go beyond 3 exposures as allowed in Canon DSLR's. I wish there was a firmware upgrade for that!! Yes - I guess the resultant images are exactly as the software requires, so assembly is somewhat easier. Having never used such a head, I'd be intrigued to know if it results in better images, or just makes life a lot easier. I was stitching a 6 shot handheld image in photoshop the other day, and although it took a long time, the result was great. I lost some of the image corners after the merge as a result of my inaccurate positioning of the camera for each image. I guess I also didn't have any complex close-in foreground, which is again where a more systematic approach would probably come into its own. A good head is always a fine thing in photography! I have two favorites. I have a ReallyrightStuff.com Gimbal Pano setup too. That is lighter and easy too use, but is not automatic. I have a Sunway interval click-stop for the swing angles and to get uniform overlap but not for the elevation angle in multi rows, just a clear guide with markings and angles. This setup weighs about 1/2 that of the Gigapan Epic Pro, but although precise, is manual. For cold weather, high buildings, multi row work and the like, however, a robot is a blessing! The Gigapan units are so convenient to set the robot and let it do the chores and perfectly! That first one, only weights 3.5 lb and could easily be added to your backpack for a digicam! and yes, they are better since one can take more pictures without backache or loss of patience. Just set the upper left view and the lower right and press go! And then there's the Merlin derivative from Kolor.com! The contribution of the French team in giving us AutoPano Pro, AutoPano Giga and Auto Pano Tour are masterful labors of gathering modules from great developers and integrating everything into well designed unified software packages. Parts of the software then have lineage to many people. So, to be fair to the field and to readers, it's important to also show off the now well regarded Astro robot, Merlin and dedicated tethered control. The software is derived from an open source collaborative effort of Merlin users who love panorama photography. I look forward to using and reviewing this pano head. I love the idea of total control tethered or wireless so one can get some rest during long tedious shoot! I haven't seen anything like this before. Exactly what does it do? > Just set the upper left view and the lower right and press go! Okay. So it will pan from L to R and do multiple rows? Can you program the degree of overlap? Can it be set for HDR exposures? It’s cool that you get to work with this stuff as an official alpha/beta tester! The Gigapan Pro was tested by many photographers I'm sure and I was just one of them and made a report. As a result, I and everyone else, were offered a unit when it finally came out, as 50% off and that was a bargain to great to be missed. I hope my feedback was helpful. The unit does seem to be much improved. The Merlin is actually an astro telescope robot which is controlled via a wireless iphone like device using software developed by a group of pano enthusiasts. Kolor packages all of this in a ready to use combo that worthy of your consideration. If your camera can be set for bracketing, then you can invoke that. You usually set the upper left corner and the lower right corner, the extent of overlap and the angles are worked out by the Gigapan Pro or the Kolor software, in the case of the modified Merlin. and bluetooth from many current phones/tablets. "The first complete and professional solution which allows to achieve automatic shooting sessions of tens, hundreds, thousands pictures simply and easily, in order to create high resolution panoramic pictures up to several gigapixels." Well Gigapan might object to Kolor's exclusivity claim, but for sure, the Kolor product is one well worth considering, especially for the very convenient cell phone interface. The panohead is addressed by a tethered controller running Papywizard, a French Public Domain community supported software for controlling the Merlin apparatus. Kolor.com strongly recommends "not to check the "Automatic connection" option to avoid Papywizard start up to be blocked due to the absence of a Bluetooth transmitter/receiver. So carefully follow the user manual instructions! You are forewarned! Read the FAQ on Papywizard to use the software from various phone and tablet and computer platforms. BTW, in addition to controlling the Orion/Merlin panohead, one needs stitching software. The are many good choices available. Kolor.com stitching software comes in 3 flavors: Mac, Windows and Unix, so most appetites are accommodated! Autopano Giga is very functional, mature and easy to use and I recommend it heartily! Asher, I am happy you have found your soul mate. Well, the Android developer/programmer trainedbrain got the job to do this for $1600. There's this, as a start. Well, for more features, the Android developer/programmer trainedbrain got the job to do this for $1600. I think the inquiry here was with regard to (an) android (that is, something like a human), not Android. Panoramas, today are so readily made with built in apps in digicams. However, with the gear in this thread, alignment can be far more precise as the pictures are taken with a stable platform!